How many of you actually love your job? I’m talking passionate, happy, excited and motivated by the life you’ve chosen. Sadly, I don’t know too many people who would raise their hands. The last paying job (early 2010) I had just about broke me. I was at an all-time low – physically falling apart with numerous ailments, mentally and emotionally unwell and I remember day dreaming about things I wish I could be doing. I felt defeated. Sounds depressing, doesn’t it? I promise, this story has a happy ending…obviously, otherwise I wouldn’t be typing this, right? After connecting the dots and realizing that my job was the cause of my unhappiness, I gave my notice and quit. I needed to take control of my life, health and well-being, as well as find my true passion…my calling. I brainstormed all sorts of ideas – everything from homemade jewelry to opening some sort of vegan, gluten-free bakery or food cart. So, I started experimenting in the kitchen with homemade donut recipes. I spent a couple of months running various trials and scribbled my creations down in an old notebook which later got lost during one of our moves. Luckily (and I owe thanks to The Life-Changing Magic of Tidying Up book) I found a few of my recipes from almost six years ago! As for finding my true passion or calling, I’m living my dream now. Being a stay-at-home mom and being able to have fun with my hobbies (recipe creating and product making) is more than I could ask for. I actually wake up in the morning excited for what the day holds, for what adventure awaits. I feel truly blessed. I’ve spent the last few weeks refining these recipes – adjusting the ingredients to my current way of eating and making them even “healthier” than they were originally. In the last few weeks I have gone through MANY trials and attempted to make these oil-free, but I gotta tell you, this is an instance where a little oil takes it from: “It’s OK” to “Whoa. This. Is. 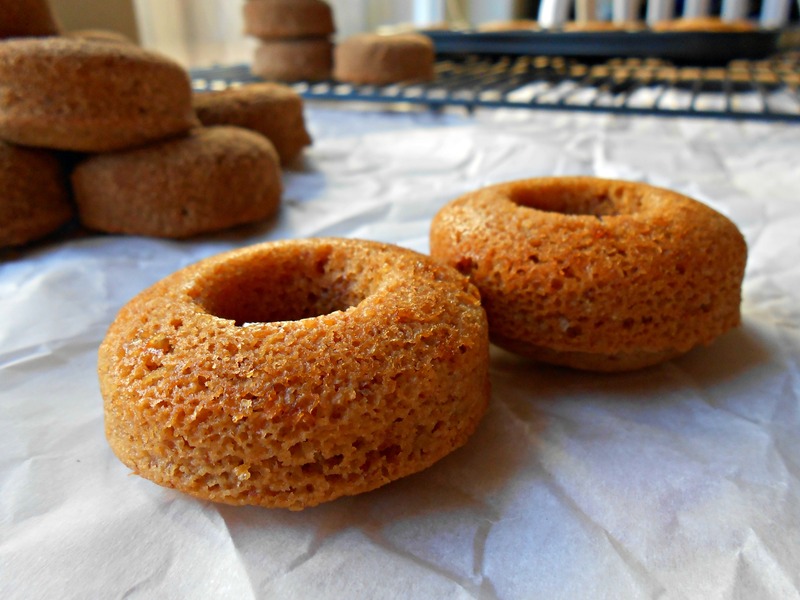 Amazing!” I am SO excited to share this first donut recipe with you! Soft, cake-y, sweet and almost melt in your mouth delicious! The combination of ground pecans and coconut oil create a buttery treat. All of the ingredients needed. Our kitchen table is always covered with large brown paper so we can doodle while we sit together…it’s also a great distraction for Willow while she waits for meals. I almost didn’t post this photo because of how messy it looks, but I felt it was important to show the process – it doesn’t need to be perfect. Preheat oven to 350 degrees Fahrenheit & lightly grease your donut pan(s) with either coconut oil or avocado oil. In a small dish, stir together the ingredients for the flax “egg” and let it sit for five minutes. Measure out your milk, ACV and vanilla; add it to a large mixing bowl (preferably to a stand-up mixer or you can use a handheld mixer). 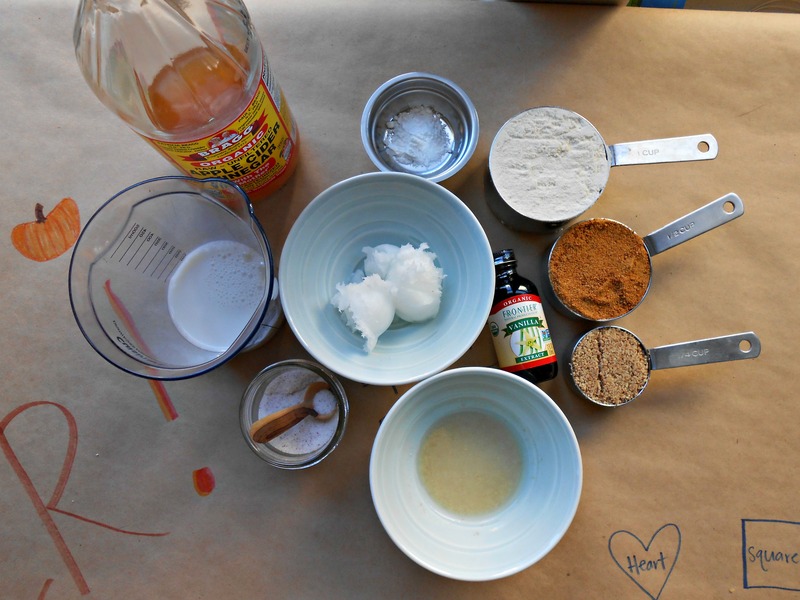 Add in the coconut oil and flax “egg,” then mix until well combined. Next, add in all of the dry ingredients – works best if you sift your flour, sugar and finely ground pecans, but my sifter recently broke…that’s what happens when a three-year-old plays with your kitchen stuff! Mix until just combined (be careful not to over mix). It will be a somewhat sticky, pudding-like consistency. Using a piping bag or tablespoon, fill each donut “cup” 1/2 – 2/3 full – do not fill to the brim as they will expand as they bake. Bake for 15-19 minutes. 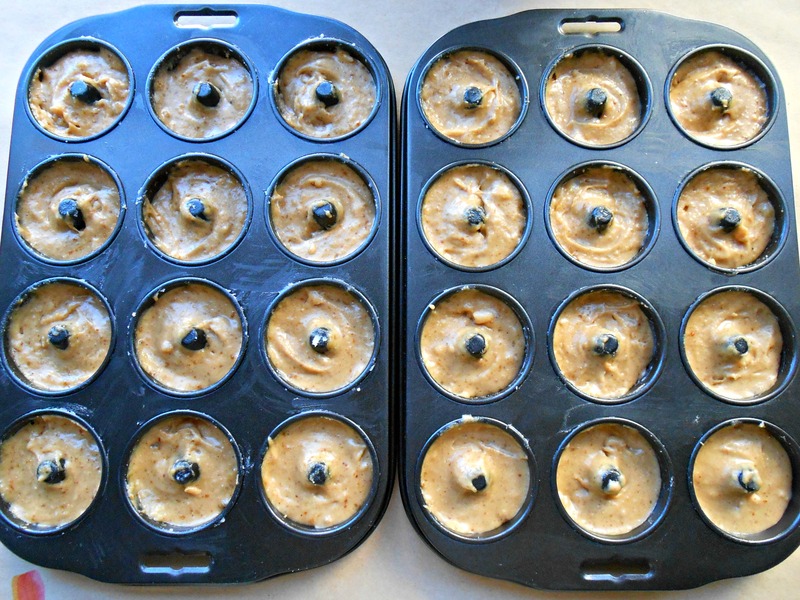 They should spring back to the touch and your tester should come back clean (no wet batter). Remove from the oven and allow the donuts to rest in the pan for five minutes before removing. You can enjoy as is OR indulge and coat them in this delicious Cinnamon-Maple Sugar mixture (see below). As for leftovers, DO NOT store in a plastic container (such as Tupperware or a Ziploc bag) otherwise they will get “wet” and sticky. They’re actually best kept on the cooling rack with a piece of parchment paper or wax paper draped over them loosely. Best eaten within the first 2-3 days. ***UPDATE*** For an oil-free version, simply omit the coconut oil and replace with coconut milk (I used full fat) – so, 3 Tablespoons of coconut milk. You might have to adjust the baking time, but start with the suggested time above. You can see which donut “cups” I overfilled! Ha! That’s OK, they got eaten pretty fast! 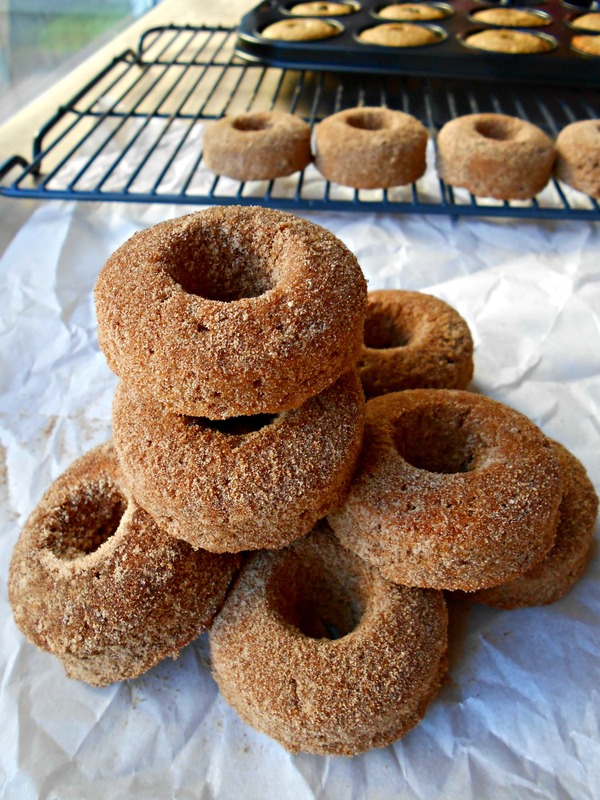 A couple of the donuts before being tossed in the Cinnamon-Maple Sugar mix. If you’ve never had maple sugar before, you are missing out! We used fresh maple sugar from Graham Farms Maple in Vermont and I’m not kidding when I say, it is the BEST I’ve ever had. Rich, sweet and oh so maple-y. The smell is absolutely intoxicating. Pure heaven. 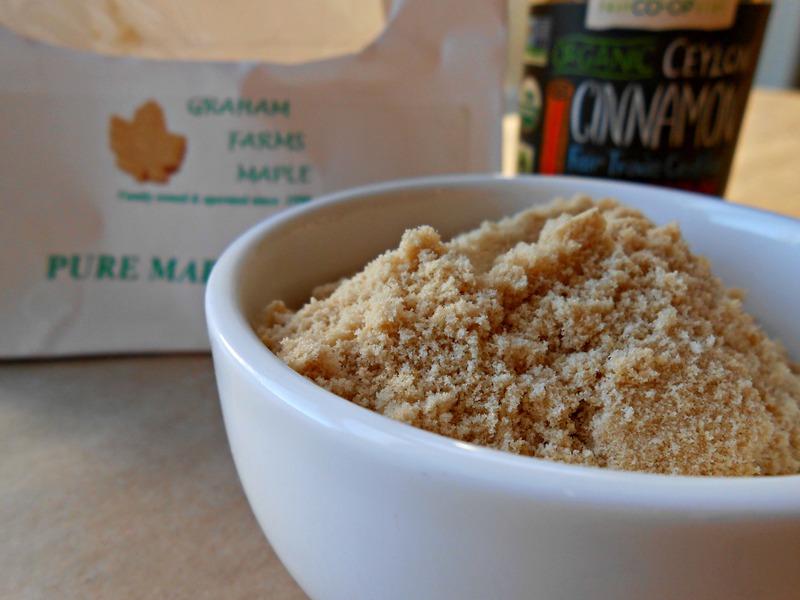 If you don’t have access to maple sugar, you can substitute it with either coconut sugar or regular sugar, but I recommend whirling it through a spice grinder or coffee grinder to get it a bit finer. I’m sure you could use brown sugar too. A close up of the maple sugar. Measure out the maple sugar and cinnamon – then add it to a medium-large Ziploc bag. After the five minutes of setting in pan, remove the donuts and shake them in the cinnamon/sugar mix. I only had a small bag, so I did a couple at a time. My little helper and taste tester patiently waiting for a donut! These are so fun sweetheart! I love the pecans! I just bought like 2 or 3 pounds at the store!!! Awww! Thank you so much!!! ❤ Pecans are easily on the top of my list for favorite nuts (with cashews and hazelnuts). Too funny, I just bought two pounds worth on Monday! 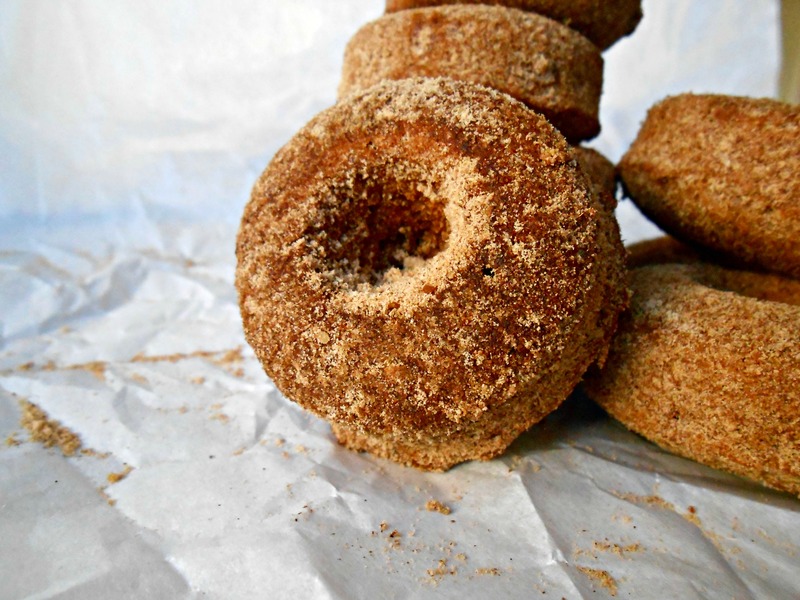 I need pumpkin flour so I can try your donuts!!! Not sure if my comment went through on your IG post (seems like there were some glitches last night), but I've tried subscribing and commenting on your blog posts, but continue to get booted off. So frustrating! I literally just drooled on my phone! These sound amazing! 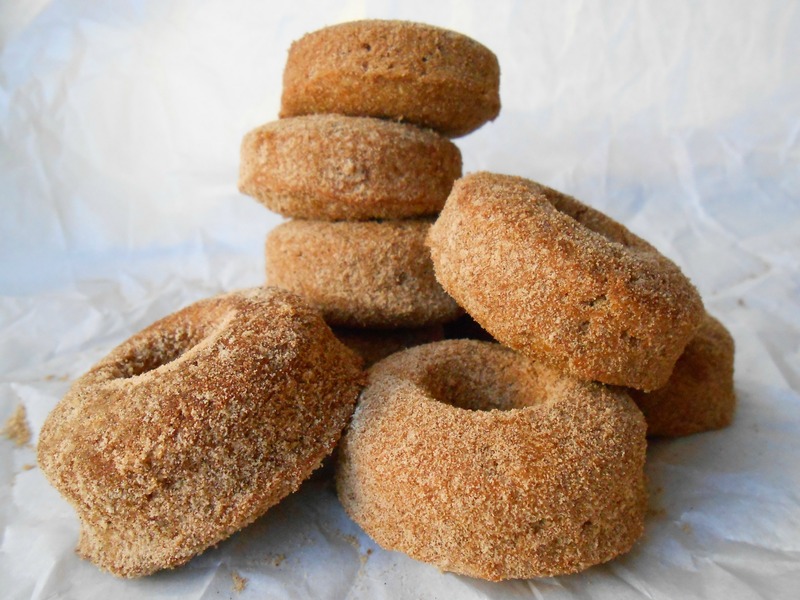 I am totally ordering some maple sugar but I won’t wait to get it before I make these! “These look SOOOO good” my exact words to my hubby just moments ago. Yummy!!!!!! Glad you found your happy place 💕. I would never have been as patient as your beautiful helper….she’s growing up too fast, and that Maple Cinnamon is just too much to not gobble every one of those up in one sitting Mandy, Gosh !!! Also, I’m so glad that you love your job now of being a mama and a magician/creator of beautiful and delicious things and lovely products…. You are where you are meant to be! Ps. Instagram isn’t letting me comment or even like your last two posts. So bizarre!! You are the sweetest!!! Isn’t being a mama the most amazing gift?! While there are many challenges that come with it, nothing brings me more joy and fulfillment than spending my days/nights with Willow. These look so tasty! I’m not much of a donut fan but the flavors here have my mouth watering!! And I love the cute little pic of Willow in the background! Oh wow! No way? 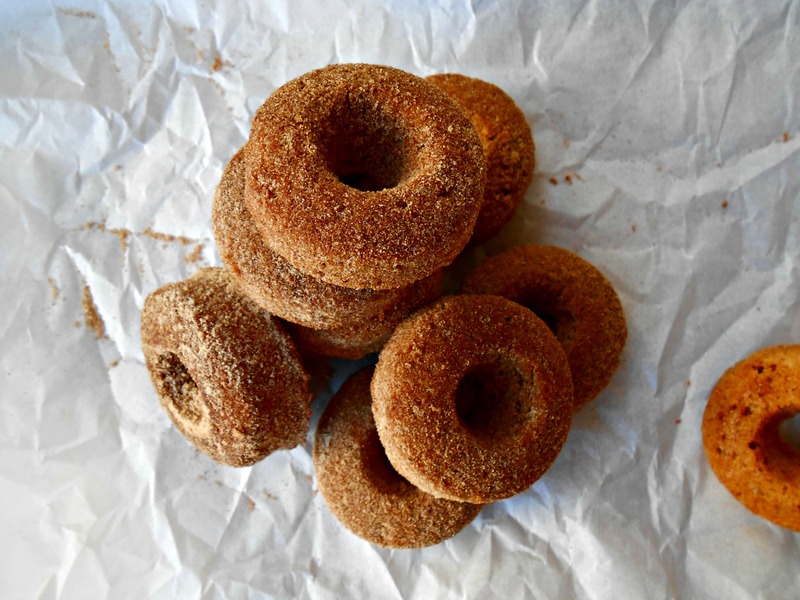 You’re not the first person to tell me that….I’m curious now as to why you’re not a donut fan. These flavors work so well together and don’t have nearly as much oil/butter as most donuts do. Danggggggg DROOL with a capital D girlfriend!! Seriously, these are the best sounding donuts EVER! I’m a HUGE donut fan but haven’t eaten any in sooo long because of course the commercial ones are just full of grease and crap, but these look amazing!! I love, love that you used maple sugar. I ran out of mine well over a year ago and now want to get some more. I’m totally craving donuts. I have both a mini donut pan and a donut machine maker thing, but the last time I used it was when Olivia was around 2 I think?? I actually wrote a double chocolate donut recipe back then when I first bought it, but never posted it because I hadn’t perfected it…so like you, it has sat and you have just inspired me to get busy and pull it back up. I still have the picture of Olivia eating it and a major chocolate face, lol! Seriously, Mandy these are gorgeous and just PERFECT! Hahaha!! Thank you, friend!! I’m a HUGE donut fan, too, but don’t get to have them very often since they’re usually loaded with things I can’t have. I know these have oil in them, but only 3 TBSP for 24 donuts…not too bad. The coconut oil really adds a wonderful flavor, too. And the maple sugar is just wonderful. 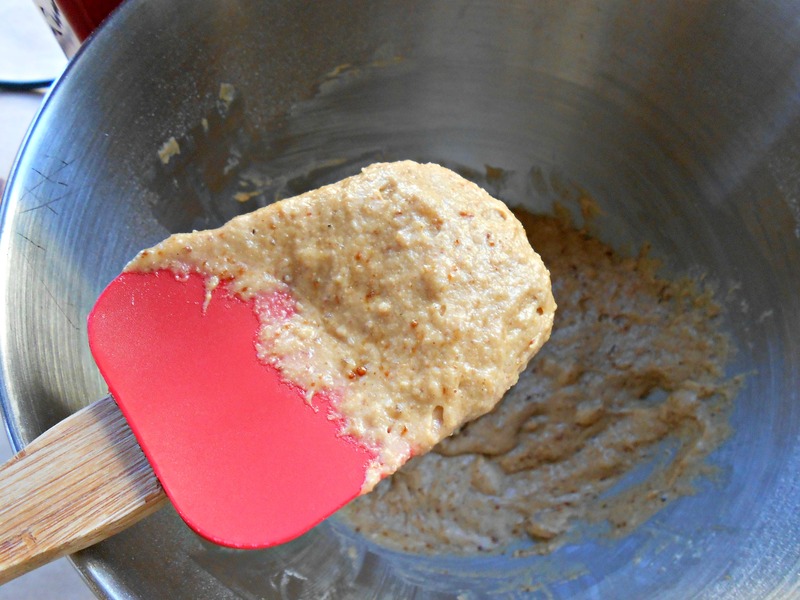 I was going to use it in the donut batter, but I know that a lot of people don’t use it – besides, I need to make that stuff last and ration it! HA! Ok, so they were beyond amazing!! I’ve made them twice already and am making them again today for company:D My only problem… I need a second pan!! I used spelt flour and unsweetened cashew milk and they came out to perfection. Thank you thank you! Now my next question, do you have a chocolate donut recipe that I need in my life?? Mandy…these were DELICIOUS!!! Our 25 days of xmas tree house this morning had a message for the kids to “make something special for breakfast”, =) and so we made your coconut pecan mini donuts! The kids had a blast! I wish I had some maple sugar because it sounds delicious, but since we didn’t, and the kids were all about chocolate and sprinkles this morning, I simply melted some dark chocolate with a little coconut oil and the kids enjoyed dipping the donuts in the chocolate and coating with sprinkles. 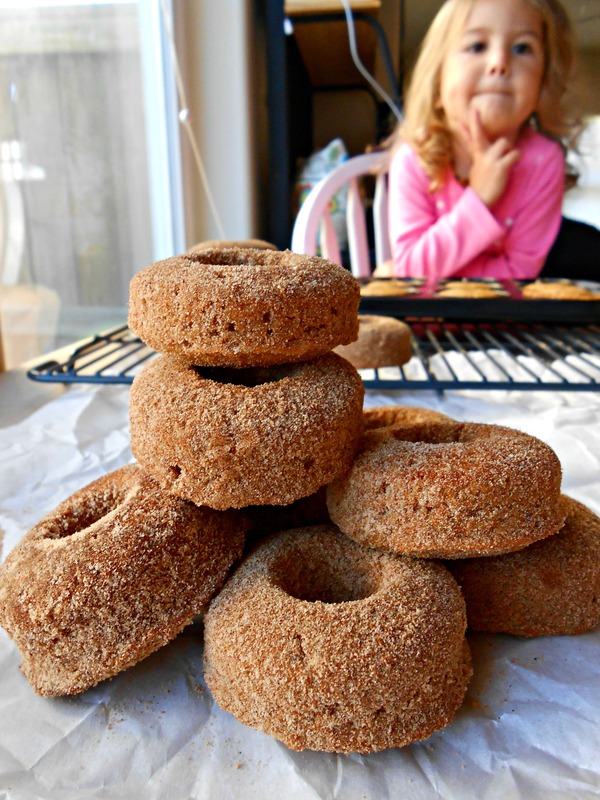 It was a fun saturday morning baking with the kids, and the donuts were delicious! Super easy to make, and even my husband LOVED them. He said we should make them for dessert at our annual friends holiday party this year…you should know that if he suggested that, then he definitely loved them! So glad I finally got around to some baking and tried out this recipe! 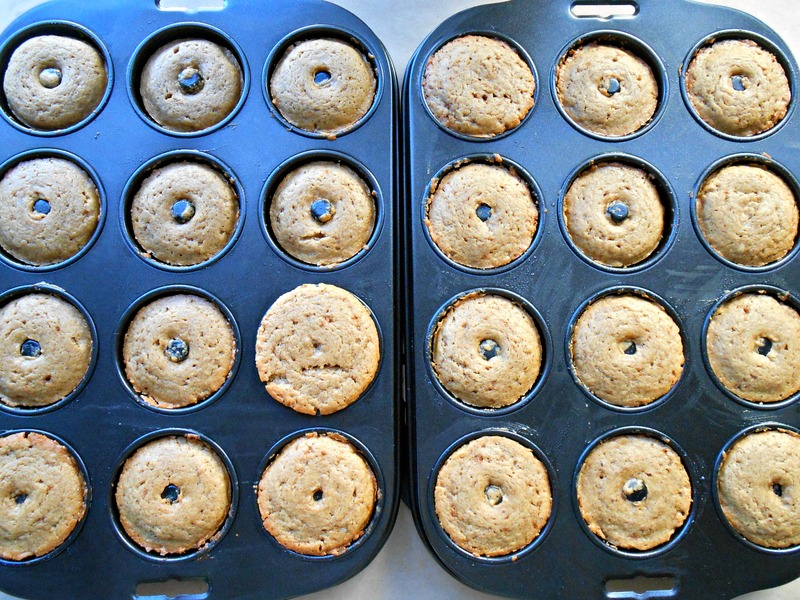 Definitely a staple…now I need another mini donut pan so I can make a double batch (I only have one). BTW…i’m doing a bite-size recipes roundup for the holidays on my site this month and would love to include these mini donuts! I will of course have a link back to your site for the actual recipe. Thanks so much Mandy! Mandy, these were nothing short of incredible! The donuts were simply heaven!! The batter was one of the most amazing tasting batters I’ve ever tried. I very much could have been totally happy just eating the batter all by itself, hahaha! As you know, I shared a pic on IG and did a chocolate espresso glaze, since chocolate and espresso are my all-time favorite combo, and my chocolate craving has been intense lately, so I did some with that and then some with the cinnamon sugar. I loved them both so much but my husband liked the cinnamon sugar better, he is not as big of a chocolate fan as I am, lol! I made the recipe as is, just used pecan butter instead of the oil. I roast my pecans and then I blend them literally until they are liquid and dripping like melted oil and it made them taste so darn buttery and amazing! Thank you so much for the recipe, I ate so many donuts, I’m ashamed, hahaha!